Tulloch Castle is a 16th century tower house, possibly incorporating earlier work, with late 19th and early 20th century additions, and stands on a hill overlooking Dingwall and the Cromarty Firth. Tulloch Hill, on the southern slopes of which Tulloch Castle stands, has been a centre of habitation stretching back thousands of years, with suggestions of Neolithic and Bronze Age occupation through various artefacts that have been found in the area. In the 11th century the area was under Viking influence, and there are references to Tulloch Castle having been built “by Norsemen” in the 1200s. Although I have also seen references to a keep or tower having been built some time between 1166 and 1185. Little mention seems to be made of Tulloch Castle until the 15th century, presumably because Dingwall Castle was the main castle in Dingwall. Indeed, it doesn’t appear on any of the early maps of Scotland, with only Dingwall Castle being marked. However in 1476, upon the forfeiture of the Earl of Ross, Dingwall Castle was seized by James III and became a royal castle. 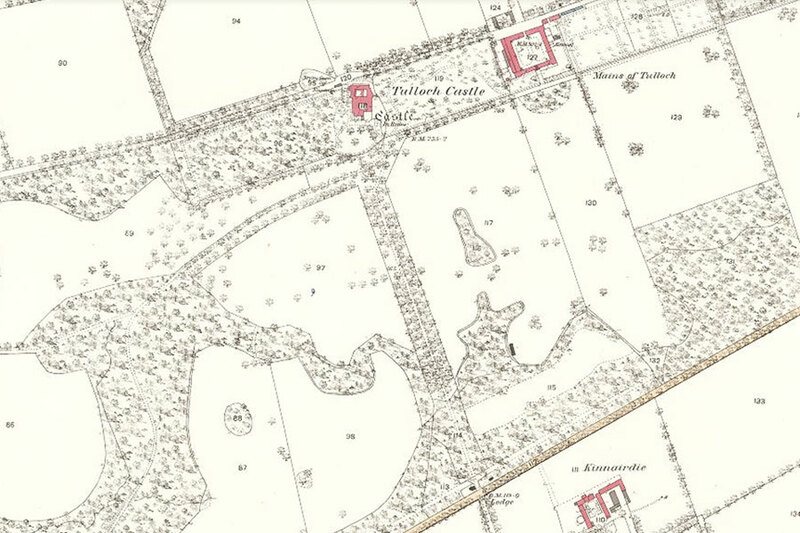 Within a century the focus seems to have shifted towards Tulloch Castle. It is said that Tulloch was only known as Tulloch from from 1507 onwards, although I don’t know what it was known as before this time, possibly Tulch, Garoch or Oulch. It was owned by the Bain family (also spelt Bayne or Bane) from 1513, and they may made some additions at this time. In 1542 Duncan Bain certainly built a keep or tower, presumably incorporating the fabric of the earlier building. The south-west corner of the current building dates to this time, consisting of a large rectangular tower with a circular stair tower at its north-west corner. The basement is vaulted, and there are several gunloops, some now blocked. Within the basement is a chamber now known as the dungeon. 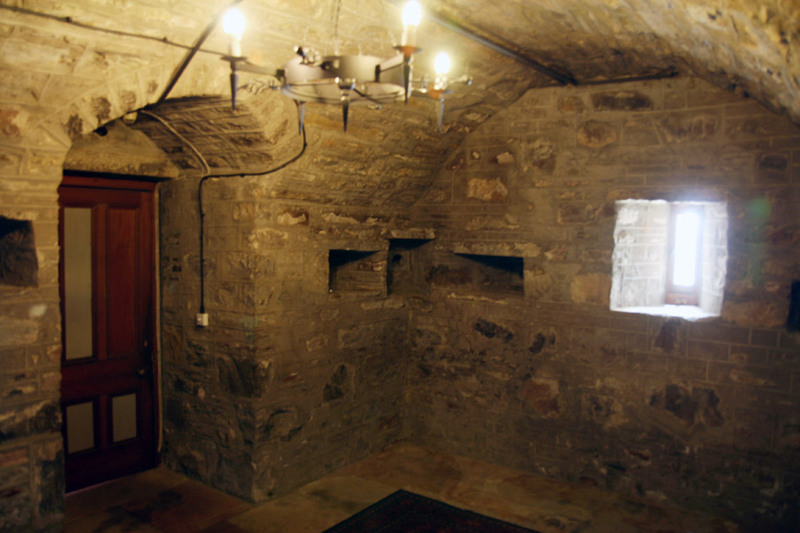 In the castle’s new role as a hotel the dungeon is used for weddings and private dining for up to 12 people. 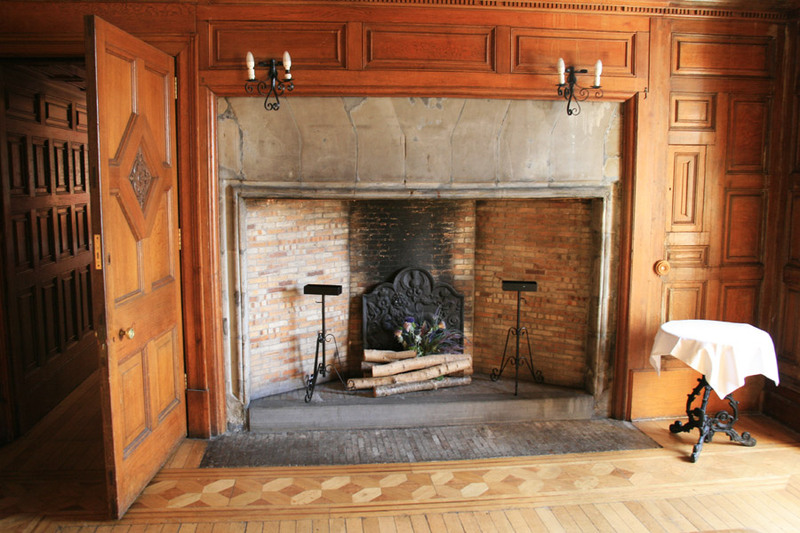 On the first floor was the main hall, and the grand fireplace still survives today. The walls of the keep are massively thick, around 2.5 metres, as can be seen between the main hall and the later wing. Above this was a further floor, and within the parapet would have been a gabled garret, although this has since been removed and a more modern castellated parapet added. By this time Dingwall Castle was in ruins, and Tulloch Castle was the most significant building in Dingwall. Despite its rise to prominence in the area, I haven’t been able to find it on any early maps, it first being marked on William Roy’s map of the Highlands in the mid-18th century. Duncan’s son John Bayne became the 4th Laird of Tulloch in 1626, and went on to become the Provost of Dingwall three times. In 1633 the Bains bought the estate of Kinnairdie from the Munros of Foulis, and in 1665 a new wing was added to the east side of Tulloch Castle. Fine 17th century plaster ceilings still survive in this new wing. Further extension and building work was carried out in 1675 and again in 1747. But by 1762 the estate was bankrupt, and Kenneth Bayne, the 8th Laird of Tulloch, sold Tulloch to his cousin, Henry Davidson, a London West India merchant who was originally from Cromarty, for a price of £10,500. Davidson was the son of William Davidson, who had married Kenneth’s daughter, Jean Bayne. Davidson invested heavily in the estate. Tulloch Farm was rebuilt, with the new farm steading carrying the date 1774. The Davidsons owned it until the early 20th century, with six successive Davidson lairds until 1917, each generation playing a prominent role in local society. Henry Davidson himself was Provost of Dingwall in 1779. Following his death in 1781, he was succeeded by his brother, Duncan Davidson, who was Provost of Dingwall from 1784 to 1786, and Member of Parliament for Cromarty from 1790 until 1796. He also continued improving the estate, and in 1789 Robert Adam was commissioned to build the folly of Caisteal Gorach on the hill above Tulloch, possibly using stones from the old castle. When Duncan died in 1799, he was succeeded by his son, Henry, who seems to have been responsible for building a racecourse to the west of the castle, which was in existence by 1827, the year of Henry’s death, although all trace of it has since gone. Henry’s son, Duncan Davidson, the 4th Laird of Tulloch, was a favourite of Queen Victoria, and was elected MP for Cromarty in 1826 at the age of 26, serving for 4 years, and then again from 1831 to 1832. He was married five times, had eighteen children, and, it is said, at least thirty illegitimate children. He was nicknamed “The Stag”. One of Davidson’s daughters, Elizabeth, is said to have fallen down the stairs to her death while running away from seeing her father with another woman. Her ghost is supposed to haunt the castle, and is known as the Green Lady. Her portrait hangs in the Great Hall. The Second Statistical Account refers to the “beautiful grounds attached to Tulloch castle”, suggesting, as is likely, landscaped policies and gardens. There were walled gardens on either side of the castle, which have now had housing built on them or become overgrown with trees. Much of the 17th century part of Tulloch Castle, along with estate records, was destroyed by major fires in 1838 and 1845, leaving the east wing in ruins. The 4th Laird of Tulloch was succeeded by his eldest son, also Duncan Davidson, who served as Lord Lieutenant of Ross-shire from 1879 until 1881. Like his forefathers he continued to improve the estate, and was responsible for, amongst other things, building lodges at the entrances to the estate. The west gatehouse no longer exists, but the south gatehouse, built in 1876, still does, standing next to the Old Evanton Road. This Duncan’s son, also Duncan, the 6th Laird, took ownership of Tulloch upon his father’s death in 1889, and in 1891 commissioned Andrew Maitland and Sons to restore and extend the castle. The farm steading was also renovated and altered in 1900. The 6th Laird was to be the last of the direct line of Davidsons, dying in 1917. 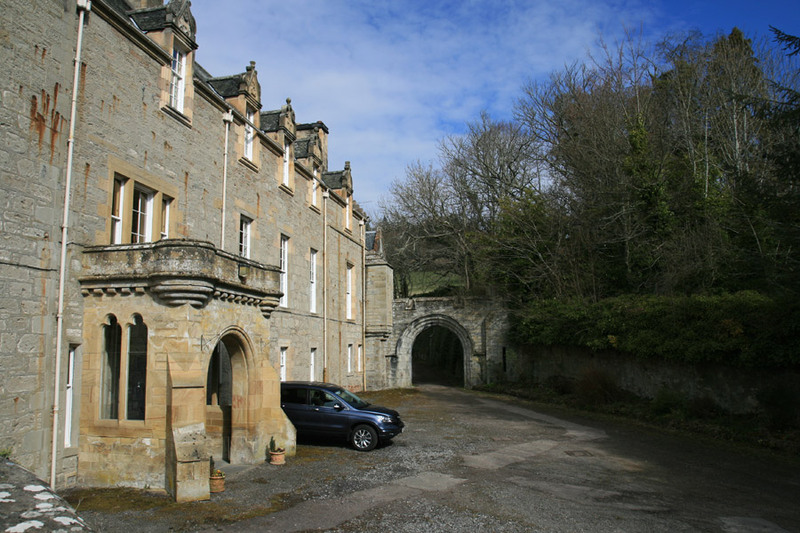 He left the castle to his wife Mary Gwendoline Mackenzie, who was to be allowed to live at Tulloch until her death, after which it would pass to the Vickers family. Douglas Vickers, Director of the famous Vickers aircraft company, had married, in 1893, Katharine Chetwynd, a granddaughter of Duncan Davidson, the 4th Laird of Tulloch. However Mary died in 1947, and Tulloch Castle seems to have been the Vickers’ family home in the 1920s and 1930s, so it isn’t clear what the exact situation was. Between 1918 and 1923 the castle was renovated, with the roof being replaced, stonework around the windows repaired, and electric lighting installed. 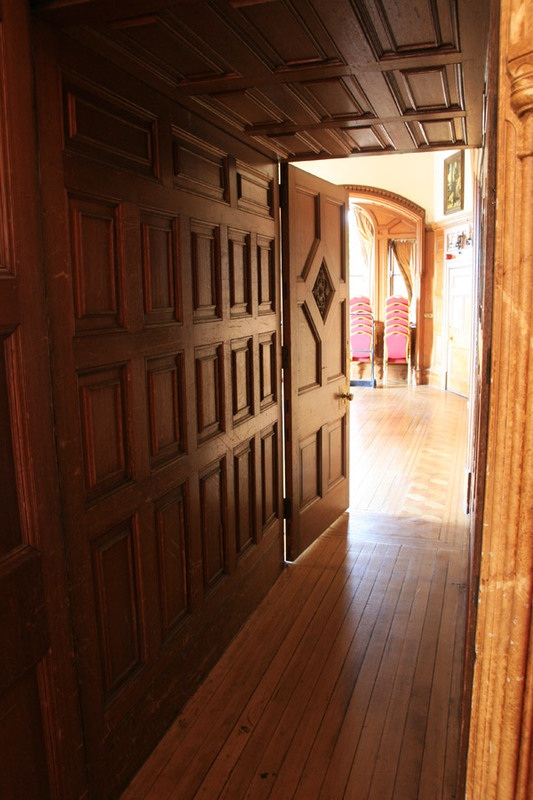 Sir Robert Lorimer carried out further restoration work on the east wing for the Vickers family between 1920 and 1922. At roof level on the south front of the east wing are what look like restored and reused carved pediments, with the central pediment featuring a new panel carrying the Davidson of Tulloch arms and the date 1920. After 1940 Tulloch Castle was used as a hospital for casualties from the evacuation of Dunkirk. Following the War and Mary Mackenzie’s death the estate passed to Colonel Angus Vickers, the third son of Douglas Vickers and Katharine Chetwynd. 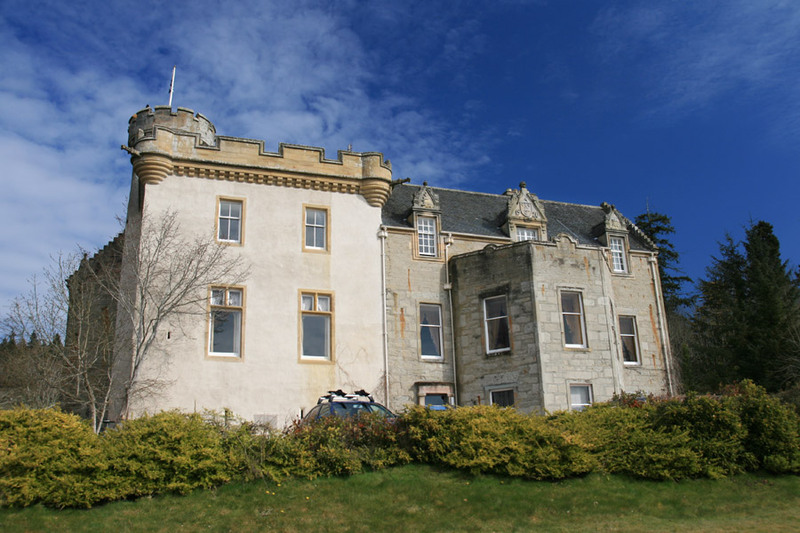 Vickers leased the castle in 1947 to Ross-shire County Council and it became a dormitory for Dingwall Academy, housing female students from the west coast. The Council later bought the castle in 1957 and it continued as a dormitory until 1976. After 1976 the castle seems to have fallen into disrepair. Over the years land has been sold off and built on, and there are housing estates on the castle’s old policies to the south, between the castle and Dingwall. In 1996 the castle was bought by Ken and Margaret Macaulay, who renovated it and turned into a hotel and conference centre. It later became part of the Oxford Hotels and Inns chain. 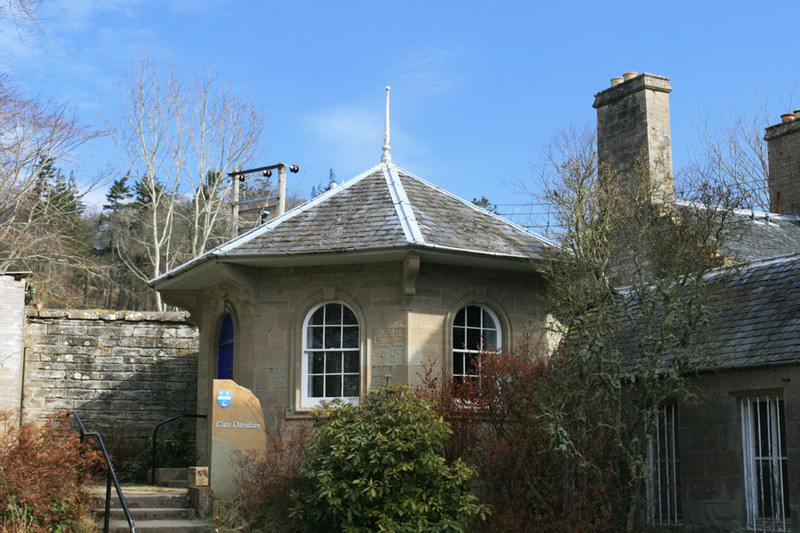 In 2007 a former deer larder in the grounds of the castle was converted into a Clan Davidson museum. Tulloch Castle had become known as the seat of Clan Davidson, and there is a Davidson family graveyard within the grounds. A tunnel is said to have run from Tulloch Castle’s basement down to Dingwall Castle, although it has now collapsed. Part of the tunnel is apparently still visible through an air vent on the front lawn. 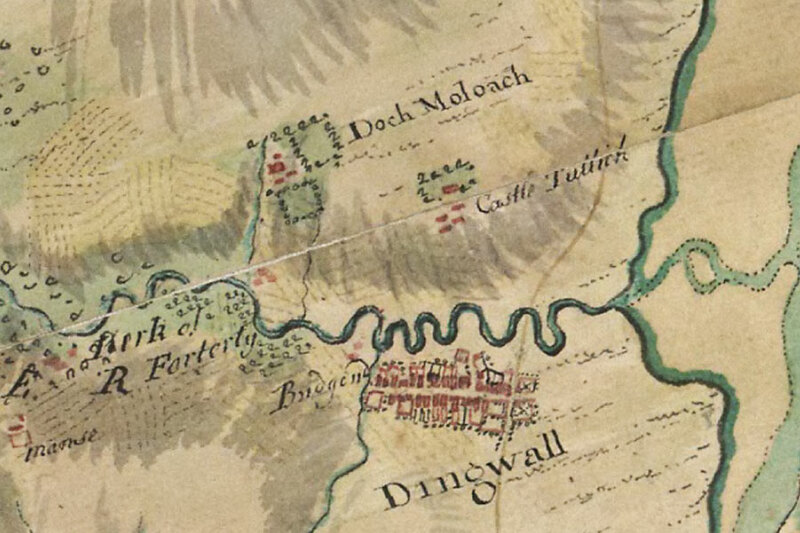 However since Dingwall Castle is some 1.45km from Tulloch Castle, and on the other side of the River Peffrey, it would have to be quite a feat of engineering, and seems rather fanciful. I suspect that the tunnel is either an old escape route from the castle whose exit is somewhere in Tulloch Castle’s grounds, or perhaps more likely it is associated with Victorian improvements. Tulloch Castle is in the parish of Dingwall and the county of Ross and Cromarty. Published on the 12th of February 2012 at 6:10 pm. Updated on the 22nd of April 2017 at 10:52 pm.